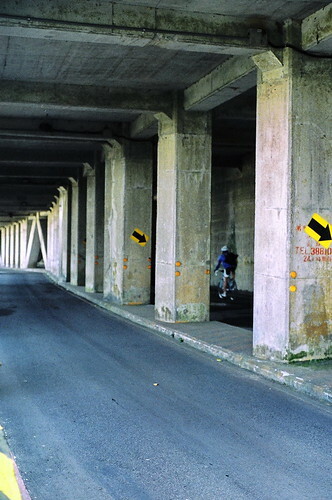 Photo Of The Day – Tunnel, Arrow, & Biker. tunne, arrow & biker. a photo by howard-f on Flickr. Ah, just before I leave to continue on with my work, I just thought I’d leave you with a photo of the day (my plan from Bloggers United will come through). Today’s photo is from Howard Fang on Flickr (howard-f), who is rapidly becoming my favorite photographer with his Nikon EM 50mm film camera… *sigh*. Anyway, getting off track, I just love the angle of this photo, the color tone, grain, and how the end of the tunnel has a touch of bokeh. The aging of the tunnel also makes this look like an authentic photo of times gone by, too, which is a change from the normal film shots I see. Previous Post Sunny Days & Birthdays!